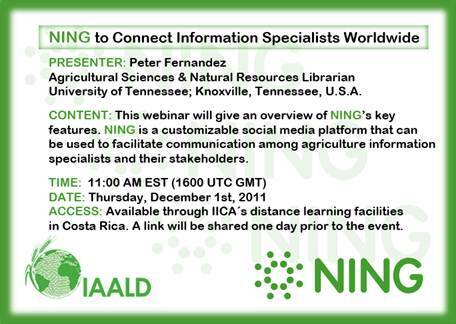 AgInfo News: Don't miss the IAALD Webinar on NING! Here is the link for the IAALD Webinar on NING, Thursday, December 1, 16:00 UTC-GMT. Participants are invited to log in at least 15 minutes prior to the start of the webinar, type their name, download Java 6, define connection speed, and check the audio. Once admitted to the Blackboard Collaborate (previously Elluminate) platform, use the CHAT to send us a short message with your name, institution and country. Don't miss this opportunity to learn and to better connect with like-minded colleagues!